On busy Sheikh Zayed Road, the highway running through the sprawling metropolis of Dubai that connects the old city with its modern eye-catching skylines, a Ferrari whizzes past at 75 miles per hour. It's a police car, a sign that Dubai -- a city often compared to Las Vegas -- has flash to spare. The second-largest and most developed of the seven United Arab Emirates, Dubai has a well-deserved reputation as an oasis for cosmopolitan luxury travelers with money to burn. 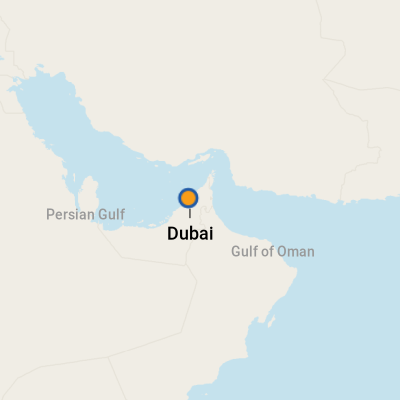 Yes, Dubai is a working port city on the Arabian Gulf, a hugely successful aviation hub with links between the west and Asia and, geographically speaking, only hours by car from places that, for most North Americans, are tucked away in the encyclopedia as distant and forbidden lands: Yemen and Saudi Arabia. But the city's most distinctive feature is its pursuit of all things over the top, from self-styled "seven star" luxury hotels and shopping malls with ski resorts to man-made islands built in the shape of palm trees and continents -- and the fact that the skyline is now pierced by nearly 150 gleaming skyscrapers. 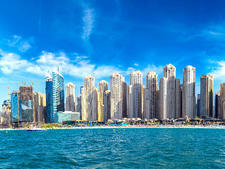 As late as the 1950s, however, Dubai was a small-time trading and fishing port. (Pearl diving was a major industry until cultured versions came into vogue.) It's possible -- although it does take some work -- to find remnants of this uniquely Emirati history. A few savvy entrepreneurs are beginning to develop cultural tourism that highlights the emirate's Bedouin roots, as well as the melting pot that Dubai has become. Although North Americans are somewhat scarce, Dubai has long been discovered by the elite from Europe, Australia and Asia, who are magnetically drawn by its resorts, gorgeous beaches, sophisticated nightlife and duty-free shopping. New attractions are opening all the time, adding a cultural layer to the more frivolous activities. That being said, Dubai -- and the United Arab Emirates, in general -- is Muslim, and morality laws are alive and well. Public displays of affection are discouraged (no kissing your partner), and gay travelers have to be discreet, as homosexuality is illegal, although this should not present a problem if you're arriving by cruise ship as you won't be checking into a hotel). Alcohol is only served at hotels and restaurants with licenses, although nowadays, there are a great many of these, and many common prescription drugs are illegal. (Bring copies of your prescriptions from your doctor.) Although beachwear is appropriate at resorts, shorts and tank tops should not be worn around town; even some malls have a dress code. Pack long-sleeved tops, capris or long pants, and long skirts and dresses if you plan to visit mosques or do a lot of walking around. 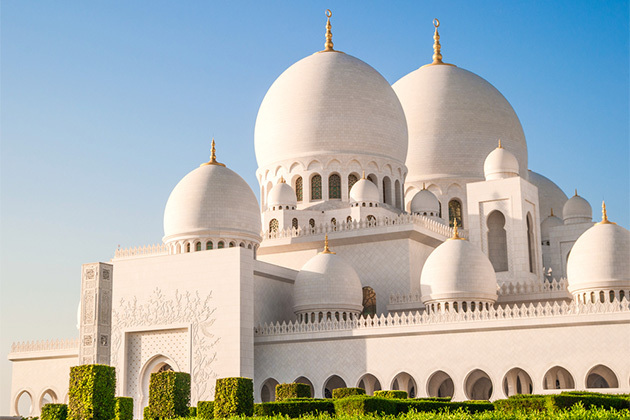 Despite its conservative stance on these cultural issues, Dubai remains a major port of embarkation (as well as port of call) for cruise travelers on popular Middle East itineraries through the Arabian Gulf or around the Arabian Peninsula to the Red Sea and Suez Canal. Even if your cruise doesn't begin or end there, you're likely to have an overnight. 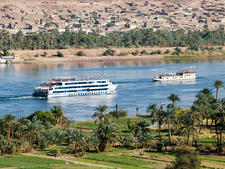 The "season" runs from October through May and is particularly popular with European lines, such as Costa Cruises, MSC Cruises, P&O Cruises and AIDA Cruises. Royal Caribbean International and Celebrity Cruises also have a presence here all winter long. If you're looking for a view into the modern Middle East -- and want a guarantee that you'll have sunny, warm weather on your vacation -- Dubai is perhaps your best place to start. Dubai has embraced cruise travelers, and Port Rashid is expanding at a rapid pace; there are now three distinct terminals. The Port of Dubai facility offers a coffee bar, a deli/lunch operation, souvenir shops and free Wi-Fi. There's a currency exchange office, an ATM, a post office and a concierge who can set you up with day tours. Several major shopping malls also offer free shuttles from the port. Other than the cruise terminal, the port facility also handles cargo shipping, so there's nothing to do in the immediate vicinity apart from visiting the Queen Elizabeth 2 (classic cruise liner), now a smart hotel and exhibition; the ship is permanently moored at Port Rashid and is a 10-minute taxi ride from the cruise terminals. 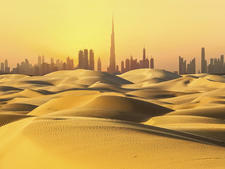 Although Dubai looks freewheeling on the surface, the United Arab Emirates is still a strict Muslim country. Women should cover their shoulders and knees, even while sightseeing; coverings are a necessity for visits to mosques or other religious sites, and malls have a conservative dress code. Displays of affection in public between couples are forbidden. Also avoid photographing Arabs or Emiratis in their native dress without asking permission. Take note that e-cigarettes are illegal, and the minimum age for consuming alcohol is 21. Having said all that, you'll quickly discover Arab hospitality, and you will, no doubt, be struck by how clean and orderly Dubai is. By Taxi: Metered taxis line up at the port. They're your best bet for day visits to Jumeirah, an upscale area of hotels, shops, restaurants and beaches, or to Bar Dubai, where most of the historic sites are located. Fares to both places are reasonable. You can use your Uber account in Dubai, too. By Bus: A hop-on, hop-off bus leaves right from the port; some cruise lines even sell tickets for this onboard. Free shopping shuttles head to Dubai's major malls from the port, as well. By Metro: Dubai is a sprawling city, but many of its downtown sights are easily accessible by Metro (alas, not from the port). Tickets are sold based on how many zones you'll cross. "Ladies cars" are available for women traveling together or with children. The currency is the UAE dirham (dh); check xe.com or oanda.com for current exchange rates. Dollars are generally not accepted, except in the souks (markets), where vendors are happy to take your cash. Taxis take currency only (no credit cards), so exchange money at the airport, or use an ATM. Arabic is the main language, but everyone speaks English, and all signage is in English as well as Arabic. As a result of its expansion boom, Dubai has opened its gates to supplement its workforce, and immigrant workers outnumber Emiratis. (However, these expats, who make up the majority of the population, cannot become citizens and, as such, have fewer rights.) You'll encounter Indians, Bangladeshis, Pakistanis, Filipinos, Russians and a plethora of other nationalities -- all of whom speak passable English. Sitting firmly at the crossroads of East and West, Dubai has every type of cuisine you might imagine -- and then some. Native Emirati dishes borrow heavily from Arabic Bedouin culture; mezzes with hummus, baba ganoush and fattoush may taste familiar, while main dishes might be lamb curry or a bowl of lentils, chicken and rice cooked in a blend of spices known as bezar. Yogurt and cucumber sauce are usually served as sides. Dates served with cardamom-flavored Arabic coffee are a traditional symbol of hospitality. If you want to drink alcohol, check first whether your chosen restaurant has a license. Even in Dubai, native Emiratis make up less than 12 percent of the city's population; the majority of people who live in the city are foreign workers, and the food culture reflects this diversity. Indian cuisine is popular, both in small curry houses and fancy hotels, and you'll find steakhouses, sushi bars, shisha lounges, celebrity chef outposts and nearly every chain restaurant on the planet across Dubai. Hotels are the easiest options for a nice lunch or dinner (especially if you want wine or a cocktail), although there is a growing number of excellent independent restaurants outside the hotel scene popular with tourists and locals. As in most Muslim countries, Dubai's weekend starts Friday, and elaborate brunches and barbecues are often served all day Friday and Saturday. Souk Al Kabeer: The Arabian Tea House, on the edge of the Souk Al Kabeer, just across the creek from the gold souk, is a great meeting place for locals and expats alike and does a fine line in sharing plates for brunch, featuring all kinds of Middle Eastern dips, salads, flatbreads and egg dishes, served in a pretty courtyard. You can get afternoon tea here, too, as well as refreshing drinks -- the fresh lemon, soda and mint is extremely more-ish. This is a city that loves shopping; there's even a monthlong festival dedicated to it. Designer goods of all kinds are available in shopping malls such as Dubai Mall (the world's largest) and Mall of the Emirates. If you're looking for something more traditional, gold in almost any form is a terrific remembrance, particularly coupled with the experience of visiting Dubai's old souk (marketplace) on the Deira side of the creek. Traditional coffee pots, known as dallah and sold in sets with small cups, are also great gifts. Dubai is the place to stock up on gorgeous scarves and pashminas, many in luxe fabrics with elaborate beading.